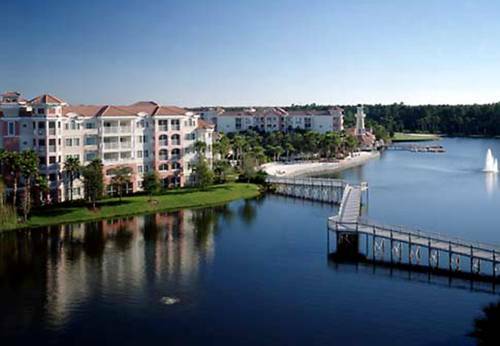 Turn new experiences into lasting memories at Marriott's Grande Vista, a premium vacation ownership resort near top attractions in Orlando, Florida. Enjoy an unforgettable golf getaway or magical family vacation in spacious one-, two- or three-bedroom resort villas with full kitchens, washer/dryers, complimentary Wi-Fi and furnished balcony. Refresh in the cool waters of our outdoor pools and energize your body in our fitness center. Perfect your swing at Grande Vista Golf Club or take a few lessons from the experts at Marriott Golf Academy. Thrill your palate with tasty American cuisine at The Grill at Grande Vista and delectable poolside fare at Copa Loca Bar & Grill. Explore legendary attractions, including Walt Disney World , Universal Orlando and SeaWorld . After a full day, pamper yourself at our relaxing on-site spa. With a BBQ/picnic area, tennis court, sauna, beach area and MAZE indoor kid's playground, our Orlando resort is designed to help our guests achieve their vacation expectations. The Grill at Grande Vista: The Grill at Grande Vista is located inside the clubhouse and showcases intricately prepared American cuisine in a casual environment. Visit our restaurant for breakfast, lunch or dinner, and complement your dining with scenic views of our golf course. Copa Loca Bar & Grill: There's no better way to enjoy the warm Orlando sun than with a drink and a meal at Copa Loca Bar & Grill. Sit outside by the pool and enjoy delicious American dining, a full bar and a relaxed ambiance. The Grande Cove Restaurant and Mist Pool Bar: Looking for a casual, on-the-go dining experience? Stop by our food court featuring Starbucks coffee, rotisserie chicken, and specialty pastas. We also offer Pizza Cucina, handcrafted artisanal pizza topped with your choice of fresh ingredients.